Consecutive light lunch trips on two days? Are we not men? Yesterday was down at the Maltings. Today is way more central in the racing heart of that Ipswich metropolis. Well, maybe a street or two away from the shopping centre, but crucially it's on the preferred route from town to waterfront. Down there a bit is trendy St Peter's Street. Up here on saints row is St Nicholas Street with handy (though pricy) parking on Franciscan Way, overlooked by Obolensky. Last time I was in number 7, this was an Italian deli: chap was good enough to sell me a crate of Chinotto. 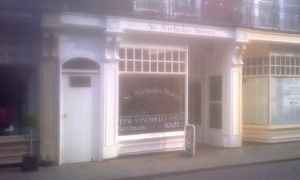 Now it's St Nicholas Stores, a mostly takeaway joint for "quality products from quality producers". Bland name, bland tagline. Step inside, though, and the bland stops playing. Rejigged interior, mahoosive glass counter and a blackboard offering ciabatta, wraps, etc. Plus one communal table, thereby satisfying a key light lunch requirement. Andy chooses chicken, chorizo and chutney in ciabatta. He *chose* that initially, changed his mind, then dumb bunny me forgot that fact so that's what he got. For me, the irresistible-sounding sticky Thai pork in a wrap. Good to see a selection of local-boy James White juices. I'll take a pineapple and lime Manic Organic. Bench has a couple of 40something spaces for us. Bonus points for providing the "i" newspaper, Private Eye and regional listings mags. Time for a chat with the lady next to us whose hubby is running the place. Six or so months into the new business and going well, which is nice. Ooh, ultra freshly prepared food is ready for us. My pork wrap was phenomenal. Andy spoke highly of his too (though he's have preferred what he thought he'd ordered). We both had flashbacks to the highly original Cook's Shed. Those regulars are queueing up and heading off with their food packets of pleasure. I'm told that even the sausage rolls are to die for. Friday and a man must make time for cake, if there's any left: it's atop the counter, and when it's gone, it's gone. Slab of banana and chocolate cake, like the accompanying latte, is really good. Yet another one of times when we'd all much prefer to flick open the paper, order another coffee and gently sigh. Go: it's great. If it was a car -- Maserati Sebring. If they were passing by -- Jimmy Doherty.